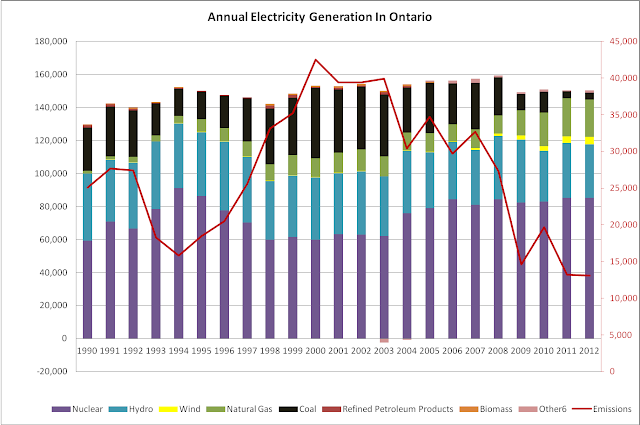 But the flip side is that the larger the share of our generation that has come from nuclear generation, the lower our CO2e emissions. The relationship between net exports, and emissions, is striking, with elevated export levels matching low emissions levels. The truth is more nuanced than these graphs indicate. 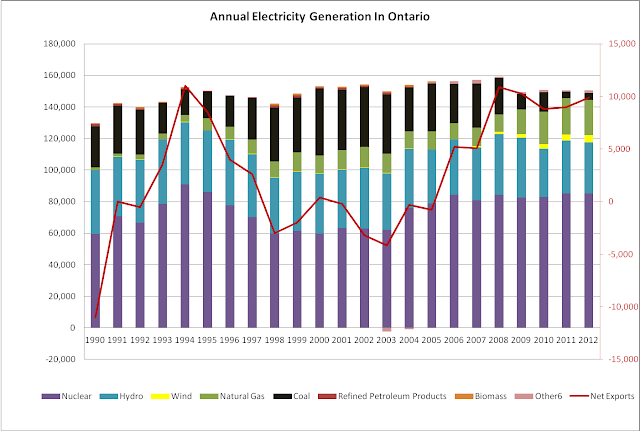 Today, for instance, Ontario's coal plants have been generating fairly high amounts of power (~1500MW) during business hours while net exports have remained about 2000MW. That isn't due to nuclear or wind. My position remains that maximizing baseload allows for the cleanest system - baseload here meaning high capital cost, and low fuel cost (hydro and nuclear) rather than commitments to intermittent renewables requiring complimentary capacity from traditional (gas/coal) generation.